At a moving event in Eachléim community hall last week members of the community were surprised and emotional when they were honoured by members of the Coast Guard for their outstanding contribution supporting the search and rescue efforts for the crew of Rescue Helicopter 116 in March 2017 in which four crew members lost their lives. Fifteen members of the Coast Guard attended at Eachléim Hall in full uniform where they presented 15 representatives from the greater Eachléim area with red and white roses, mirroring the colour of the rescue helicopter. Each were volunteers who gave their time endlessly over the 42 day search period. They also presented a plaque to Seán Ó'Gallachóir who led the community at the time. Gathered together to recall the events for the filming of a new TG4 documentary Bailte, presented by Síle Nic Chonaonigh, the community was not expecting to have the attendance of 15 Coast guard members from the Ballyglass Coast Guard Unit. Michael Hurst, Officer in Charge of co-ordinating the ground search operations for over 42 days as well as his Deputy Frank Murphy and 13 other members of the unit, gathered at the hall, much to the surprise of the local people. Nor were they expecting a fly over by SAR helicopter rescue 118 who were in attendance for over 15 minutes, as a mark of respect to the community for their efforts in searching for their colleagues. 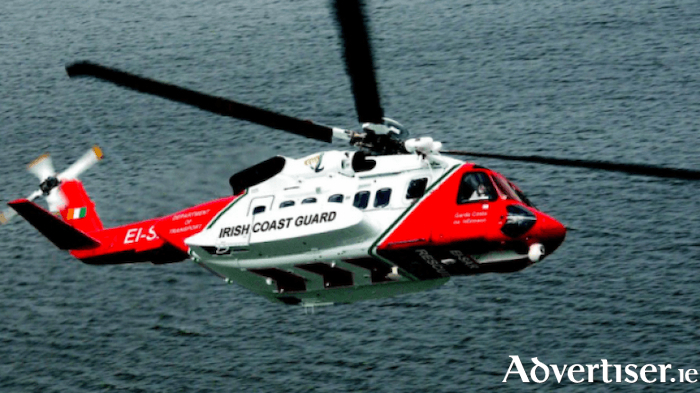 Rescue 118 was captained by Captain Brendan Jackman. Tributes were paid to the contribution by the people, which was described as unquantifiable. Food came from all over the country and over 30 mouths were fed three times if not more a day. Not only did they provide sustenance but also comfort and consolation to all those who searched and to the families. John Ó'Gallchóir recalled the dedication of one woman in particular, Winnie, who was there from morning to night to ensure all was done to feed the hundreds each day, serving options of five meals to an array of national agencies including the coast guard, Navy, Gardai, Civil defence, and army, RNLI. In the film documentary it was also noted that most of the locals were moved to help because its what we do - "and because they'd lost people sea themselves. How could you be at home when you needed to be here. You'd rush out of work just to make sure you got back here. Many of the locals also took in people and gave them beds." The new documentary series Bailte telling the stories of communities in townlands all around Ireland, including the community of Eachléim, and presented by Síle Nic Chonaonaigh, will be screened on TG4 early in 2019.